As women, we're told we can do it all! We can do anything! But we're never taught HOW to "do it all" (especially in a way that keeps ourselves feeling vibrant).... so we just work harder and harder. It's the legendary "hampster wheel." Each accomplishment comes at a price. Over time we wear down. We may invest so much of our energy going for "it all" that we feel there is just not enough of us to go around! We have all of those areas of our life to tend to... work, family, managing a home, intimate relationships with a partner, friends, and handling the unexpected! I often hear moms say "I feel guilty when I'm at work that I'm not with my kids, and I feel guilty when I'm with my kids that I'm not working." We hear a lot about work-life balance, but buried in responsibilities it can seem like the "Whack-A-Mole" game! We give a lot, and our needs for self-care get put on the 'back burner' just to keep up with juggling all those responsibilities. Then..... As overwhelm sets in, we wonder "How long I can keep this up?" Do you often feel zapped of energy levels, joy, and fulfillment? Health and well-being begin to be compromised. We realize we are stretched thin, and when that happens... our true capabilities and levels of performance begin to dwindle. The wake up call is when you begin to shut down and you realize something has to change for the sake of your family and self. 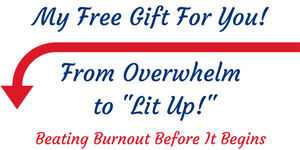 Stop the overwhelm, exhaustion, and feeling spread too thin! Rekindle your energy and motivation to handle the important areas in your life! Rebuild your dreams and experience a beautiful, radiant life! Become physically, mentally, and emotionally able to consistently maintain levels of high performance! Are you ready to take back control of your life, your healthy, vibrant energy and fulfillment? Doing so may sound like a huge feat or leap which may seem out of the question at the moment. I have a proven system that is designed for your success, and I want to assist you. My joy and mission in life is to help women minimize wasted time, and accelerate their path to live a meaningful life they love... and feel great doing so! Let's face it, we've done a lot of trial and error. Why not use your precious time and energy to bring a payback that creates joy! I have a gift for you! I want to get you some immediate momentum to stop the overwhelm now! Sign up below! From Overwhelm to Lit Up! 6 Audio Modules are crafted to give you the tools you need to stay calm, focused and energized in the pursuit of your goals. They explore what burnout is, how it happens, what signs to notice, how to avoid it, and how to bounce back if burnout strikes you. Plus there are many strategies for managing your well-being so you don’t even become at risk for burnout. Each 5-7 minute module is designed to help you develop a stronger, healthier, more resilient YOU. These lessons give you everything you need to design your very own emotional defense system, so that you can stay on track and motivated to create the rich, rewarding life of joy and fulfillment that you deserve, instead of getting caught up in the demands and pressures of life and ultimately succumbing to burnout. Don’t waste another precious moment!!! Use the Sign Up form to the right to get started today. Free 6 Part Audio Training to give you the tools you need to stay calm, focused and energized in the pursuit of your goals. They explore what burnout is, how it happens, what signs to notice, how to avoid it, and how to bounce back if burnout strikes you. Plus there are many strategies for managing your well-being so you don’t even become at risk for burnout. Each 5-7 minute module is designed to help you develop a stronger, healthier, more resilient YOU. 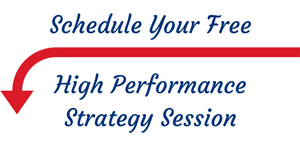 Would you like to discover how coaching can help you with high performance? Click below to schedule your 60 minute complimentary session with Coach Andrea for an assessment and some immediate value you can use right away!